When summer rolls around, it’s all about the sunscreen. We spend long hot days out in the sun and slather SPF lotions all over ourselves to prevent those dreaded sunburns. We’ve got the routine down to a science, and we’re always proud after spending a day at the beach and not getting burned. But here’s the thing—when summer is over, your sun protection duties are not! The sun is out every day of the year, even on cloudy days. Fun fact: about 80% of UV rays penetrate through clouds, so it’s crucial that we keep up with protecting our skin no matter what season it may be. If it’s daytime and you’re outside, you should be wearing sunscreen (at least SPF 30 is recommended) on all exposed skin, no exceptions. If not for the sake of your skin’s health to help prevent cancer, do it for the sake of beauty. No one wants the extra wrinkles or age spots excessive sun exposure can produce. Sunscreen is recognized as the most effective anti-ager when it comes to preventing premature wrinkles. 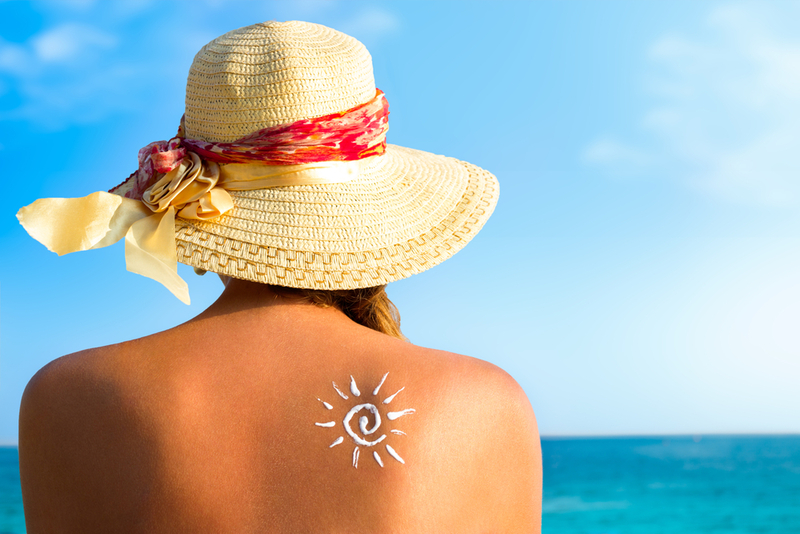 Here’s some tips on how to get total-body sun protection. These days there are so many options when it comes to sunscreen it can be hard to decide what to use. We are no longer limited to the stuff our parents bathed us in as children—you know, heavy, greasy, sticky cream that smelled like chlorine. These days, most are light and easily absorbed into your skin and actually feel good to put on while you tan at the beach. The sunscreen lotion you put on your body will most likely be different than what you apply to your face. The skin on your face is delicate and more prone to breaking out, so you should use a formula specifically designed for that type of sensitive skin. Find a facial sunscreen that you can easily put on under your makeup without feeling greasy or heavy. And don’t forget your extra sensitive eye area where we tend to get fine lines wrinkles. Opt for an eye cream with spf that brightens your eye area and reduces dark circles, while giving you added protection from harmful UV rays. You can also kill two birds with one stone and purchase makeup products with sunscreen built in to the formula. This is a great option when you don’t want multiple layers of product on your face to clog your pores. However, it’s still a smart idea to use a facial sunscreen underneath your makeup if you plan to be out in the sun for extended periods of time. Now for your lips. We often overlook them when it comes to our skin care routine, but they need just as much protection as our other skin. Skin cancer in this area can be especially dangerous, so we need to be diligent about protecting our mouths. Luckily there are several lip balms, chapsticks, and lipsticks that do exactly that. You can find them in a variety of colors, as well as a translucent shade, so there is truly something out there for everyone. Do you already have a favorite lipstick but it doesn’t have SPF? Not to worry. Use an untinted chapstick or lip balm under your favorite shade and you’re good to go! Dermatologists recommend reapplying sunscreen every 2 hours when we’re outdoors, which isn’t always ideal when you have a full face of makeup on. This is where mineral powder sunscreen comes in. Just brush on a light dusting of the powder right over your makeup, and you’re all set. It provides a little extra coverage to even out your complexion and reduce shine while giving you a boost in skin protection. It’s easy to carry with you while you’re out and about, making reapplication every 2 hours a breeze. When it comes to sunscreen for your whole body, you have a plethora of choices. There are lotions, sprays and foams—some are scented and others are unscented, all with varying degrees of SPF protection. Remember you need at least 30 SPF, but if you’re planning to be out in the sun by the pool or at the beach for the day, go a little higher. Protecting yourself from the sun year-round might not seem critical if you live in a cool climate, but the damaging effects of UV rays can reach your skin no matter the weather. With a few simple steps, you can prevent any further damage to your complexion and have healthy, glowing skin for years to come.